I asked myself: is this a scam? 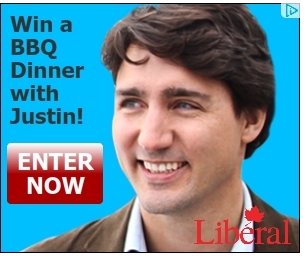 It has the Liberal Party wordmark on it, so I figure it's legit although... the graphic quality isn't great. 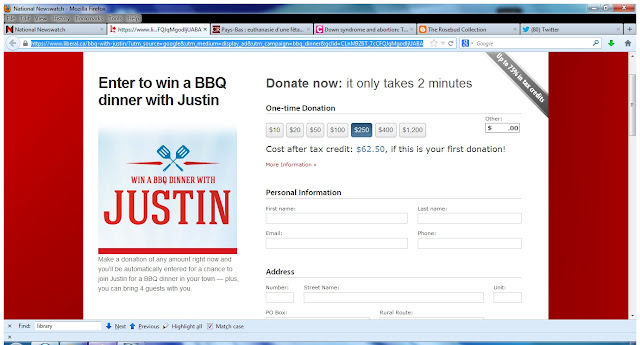 So you don't NEED to donate to enter, but if you DO donate, you will be entered. There's the suggestion that money gets you potential access to Justin Trudeau. Not just handshaking access like you might get at a rally. But personal access. But doesn't that lend itself to all kinds of deviousness? 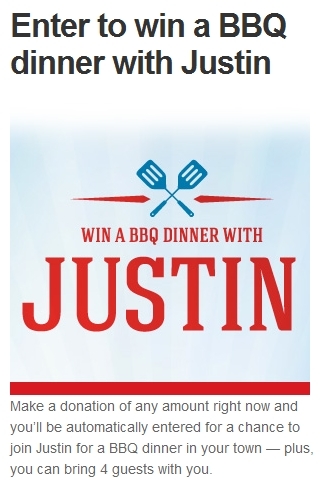 Like, if I were feeling really, really mischievous, I'd get thousands of my closest pro-life friends to enter and then when we win the barbecue, we'd bring up our concerns about fetal rights and the fact that he is not following the Catholic faith. I mean we don`t have to donate, do we? Don't be surprised if this blows up in your face.